"friendsergy - 3 little Muensters" dissecting the layers of the piece. I started this project this August 2015. The first layer- My husband grew up in Muenster Texas - hence 3 little Muensters. Curtis and his little sisters we're caught on film in the early 60's trying to balance on their heads on the family sofa. The film has since been transferred to a DVD. 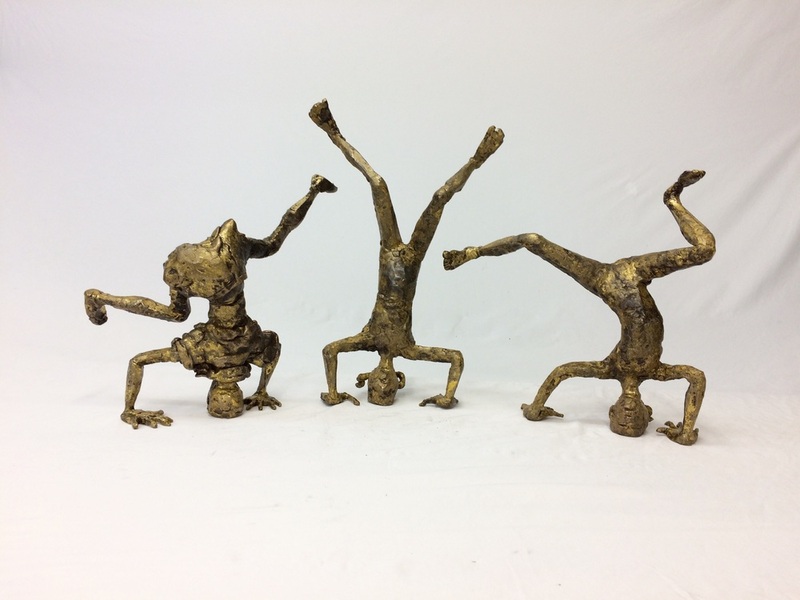 Watching the DVD for the first time made us all laugh and inspired the initial concept of a sculpture of children standing on their heads. Screen shot from a klement family home movie. The second layer- I took many years of ballet and gymnastics when I was younger and I found it interesting to see one person loose balance and then everyone loose their balance without anyone touching. The force or the energy between objects that you can't see is what I wanted to capture. The third layer- keeping the style loose and expressive utilizing expressive lines not only in the shape of the piece but in the texture of the surface.